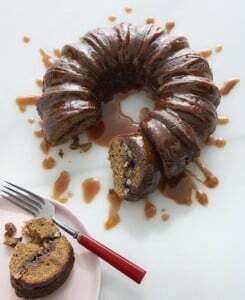 Who doesn’t love a Bundt cake? In this banana-laced version, the unique flavor of palm sugar makes the cinnamon-spiced pecan filling absolutely crave-worthy. The cinnamon drizzle is optional but highly recommended for gilding this wonderful cake with more sweet cinnamon. Recipe and photo from Big Vegan: More than 350 Recipes, No Meat/No Dairy All Delicious* by Robin Asbell. Preheat the oven to 350°F. Oil a Bundt pan. In a small bowl, combine 1/2 cup of the sugar and the cinnamon and stir until well mixed. Stir in the pecans. In a large bowl, combine the flours, baking soda, baking powder, and salt and whisk until well mixed. In a food processor, combine the bananas and remaining 1/2 cup/100 g sugar and process until smooth. Add the nondairy milk, oil, and egg replacer and process until smooth and frothy. Pour into the flour mixture and stir until just combined. Pour half of the batter into the prepared pan and spread it evenly. Sprinkle the pecan mixture in a line down the center of the batter, then push it into the batter lightly to make a tunnel of pecan streusel. Pour in the remaining batter. Spread it in an even layer and smooth with a spatula. Bake for about 45 minutes, until the top is golden brown and a toothpick inserted in the center comes out with moist crumbs attached. Cool in the pan for 10 minutes. Run a table knife around the edges (both inner and outer) to loosen the cake, then cover the pan with an inverted cake plate. Using oven mitts, hold the pan tight to the plate and invert to drop the cake onto the plate. Let cool completely. Meanwhile, make the cinnamon drizzle (if desired): In a cup or small bowl, stir the agave syrup and cinnamon together. Drizzle the mixture over the cake. Stored in the refrigerator, tightly covered, the cake will keep for about 1 week. Robin Asbell is a cookbook author, culinary instructor, speaker, and chef. Visit her at her web site, Robin Asbell. Here are more of VegKitchen’s Easy Vegan Cakes and Pies.